Good nutrition is vital for people undergoing cancer treatment, but so often the side-effects of the treatment make food unappealing and eating becomes a struggle. 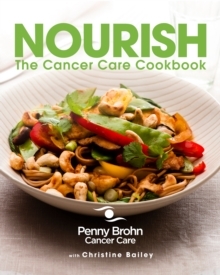 In Nourish you'll find easy-to-follow recipes designed specifically for cancer patients (and their families). The focus is on nutritious food that can be easily tolerated - and can help to alleviate common symptoms and side-effects, and form a crucial part of any cancer treatment programme. The role of nutrition is explained and the introduction outlines clear advice on cancer-fighting foods and how to tackle side-effects. For many suffering with cancer, eating little and often is important, so Nourish includes plans based on eating small meals six times a day. There are more than 75 recipes presented in four chapters - 'Drinks, Juices, Smoothies, Shakes & Teas', 'Soups, Light Meals & Snacks', 'Main Meals' and 'Desserts & Baked Treats' - as well as a chapter with recipes that are helpful for common side-effects. All the recipes are delicious yet simple to make, and many can be made in advance to make mealtimes hassle-free. Whether you are undergoing treatment, have opted to eat healthier as a preventative measure or are supporting someone through cancer and wish to provide nourishing dishes for them, this book will be your culinary guide.